Jessop today has the capacity to produce a wide range of cranes under one roof.With a vast manufacturing infrastructure equipped with modern machine tools,state-of-the-art technology,quality assurance systems and a computerized design and engineering facility within the workshop complex. Jessop provides tailor-made solution to every material handling applications, meeting the exact requirements of the customers.Jessop has been awarded ISO 9001 Quality System accreditation for its entire range of cranes and associated equipments. 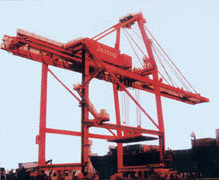 Container Handling Cranes-RTGs, RMGs & RMQCs. Dock-Side and Wharf Cranes for handling unit/bulk cargo. Large Capacity Goliath Cranes for ship building/ship repair facility. Static amd Mobile Tower Cranes for erection of heavy structures. EOT Cranes for Power Plant. Ladle Cranes for handling molten steel. Ingot Stripper Cranes for Steel Plants. 450 + 100/20 Te x 25 M Span Ladle Crane for Bokaro Steel Plant. 300 + 60/20 Te x 21 M Span Ladle Crane for TISCO. 250 + 80/10 Te x 24 M Span Ladle Crane for Rourkela Steel Plant. 200 + 50/15 Te x 15 M Span Ladle Crane for Durgapur Steel Plant. 30/7.5 Te x 33 M Radius & 25/5 Te x 15 M Radius Level Luffing Cranes for DGNP, Mumbai. 60/10 T x 36M Radius Level Luffing Cranes for Hindustan Shipyard,Vizag. 120T X 65 M Radius Level Luffing Cranes for Dubai Dry DOck. 150 x 10 T Goliath Crane for Port Dickson Power Station, Malaysia. 300 x 50 T, 28 M Span E.O.T. Crane for BHEL,Tiruchirapalli. 50 T x 73 M Tower Crane for BHEL,Ramagundam Super Thermal Power Project. 200 T Diesel Electric Rail Crane for Bokaro Steel Plant. Jessop had technical support from following collaborators and during the course of collaboration have successfully absorbed the technologies to become a leader in manufacture of cranes.